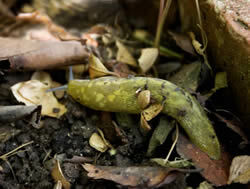 The Yellow Slug (Limax flavus) is fairly common but not often seen as it is highly nocturnal. It feeds on lichen and algae and some other decaying matter. It is definitely not a pest. Individuals all have markings as individually identifiable as human finger prints. At this time of year they emerge at about 22:00. Those that feed on lichen on the roof take about an hour to climb the house walls. They then feed on the lichen on the roof tiles for about 3 hours before returning to ground level - another hour's journey to be back lurking somewhere cool and dark before first light at around 04:00. 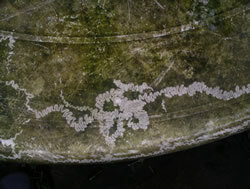 The picture (right) shows what they can do - a trail of their tooth marks clearly visible in the green slime on a picnic table. The above image was a rare daylight glimpse of the Yellow Slug that was found under a shrub in a domestic garden. On 4th August 2008 BBC Nottingham local news featured Beckingham and its slugs - click here to be directed to the story on the BBC Nottingham web page.